Find more reviews at The Demon Librarian.Mist the Mark.I have conflicted feelings on this one. I happen to love all things Norse mythology and have read several great series that feature it. But where other series merely borrow from the mythology to add flavour to their worlds, Mist is infused with it from root to tip. It's both its biggest asset, and its greatest downfall. And I'll try and explain why.Kicking off with a prologue set in World War II era Norway, Mist wastes no time packing in the mythology. Within the first 5 pages we've been bombarded with several god's names, a brief run down of their role in things and what they're capable of. I was instantly overwhelmed and trying desperately to memorize things in case they were important later on. It was just a lot to absorb. If there's such a thing as UF lite, then this was UF heavy to the extreme, and rather than making it seem more rich and colourful for it, it just felt dense and bogged down instead.Following on from that, the first couple of chapters were actually much easier to follow as we join Mist in present day San Francisco, and at this point in the read I was even feeling pretty confident that I could enjoy Mist if I was willing to put in some work. The basic set up is that she and a few of her Valkyrie sisters are the only ones from the Old World left on Midgard after Ragnarok. Or a failed Ragnarok, as it happens. For those who don't know what Ragnarok is before reading this book, well, you're going to struggle, frankly. I at least have a passing knowledge of it from reading a couple of other series that mention it, but even I was getting bamboozled a lot of the time.Anyhoo, each Valkyrie has been given a treasure to keep and protect such as Odin’s spear, Freya's cloak, or Thor’s hammer. Mist has the spear - arguably the most valuable of all the treasures. Why Mist? Well, you'll find out, as she will, that there's more to Mist that being a mere Valkyrie.I found this aspect hard to fathom as well. Mist is two millennia old. To have someone at 2,000 suddenly find out all these things about themselves that they never even suspected, smacked of implausibility to me. I suppose if you consider how cut off she's been from her kind and that she's not had much cause to test herself, it kinda makes some sense, but I was still giving the book the squinty eyeball at times.Mist is written in alternating POV’s, much like traditional fantasy which also made if feel different to the many other UF series I've read. I'm used to having a smart, snarky main character to experience things through, often in first person, but sadly that wasn't the case here and I didn't really connect to Mist in the way I'd hoped. There were some interesting characters, however. The Alfar, Dainn, was an fascinating chap. Probably the most complex and conflicted of the bunch. Sadly, he's also somewhat weak - a beta to Mist's alpha - which in this instance didn't work for me either.My last complaint (I honestly didn't think this review would be so whiny when I started it, sorry!) is that there was just too much dialogue. And I love dialogue! Usually. But here there were pages and pages of paragraph-long diatribes which, although well-written, just weren't exciting. 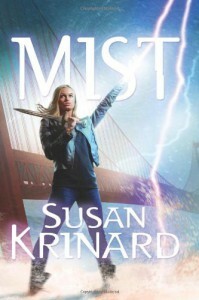 Another thing that added to the weighty feeling of the book.So, do I recommend Mist? Well, maybe if you are a superfan of Norse mythology and literally don't think there's such a thing as too much, then yes. For the rest of us mere mortals, I'm afraid I can't in all honesty give Mist the Demon Librarian Seal of Approval and I won't be reading the next book in the series.3 Stars ★★★ARC provided by the publisher in exchange for an honest review.